[QODBC-Desktop] Troubleshooting - How do I know which version of QuickBooks my QODBC license works with? Troubleshooting - How do I know which version of QuickBooks my QODBC license works with? How do I know which version of QuickBooks my QODBC license works with? 4. In the middle of the About Tab window, you will see a hyperlink that says “Check website for updates”, just below this, you will see your Serial Number in the format X00X12345678. The second and third characters indicate the QuickBooks year number (e.g. 13 is for 2013 and earlier, 12 is for 2012 and earlier) that your QODBC license is compatible with. The fourth character is "U" for the USA, "O" for Australia/New Zealand/South-East Asia, "K" for UK/Europe, Middle-East and Africa editions of QuickBooks. Other letters are for different regions. The remaining characters form the rest of your serial number. So if you have a Serial Number of W16U12345678 your QODBC license is a Read Write version compatible with QuickBooks 2016 US edition and earlier. If you are using QODBC Read Only which comes with QuickBooks Enterprise, then you will notice Licensed To: QuickBooks Enterprise User in the middle of the About Tab below the “Check website for updates”. How can I know for which year and QuickBooks my QODBC license valid for? Can install higher QODBC version with the lower license? QODBC license is licensed for QuickBooks Version(Year). E.g. If you have QODBC Licensed for 2015, You can use QODBC with QuickBooks 2015,2014,2013 and so on but not with QuickBooks 2016. You can install QODBC v15,v16 with no upgrade cost. Upgrade cost is only applicable when your license does not match the year. 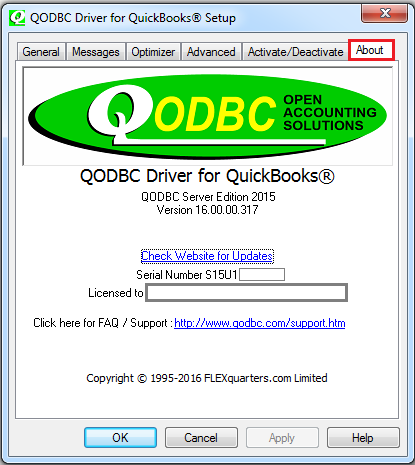 If you have QODBC licensed for 2015 & you are using QODBC v15 & QuickBooks 2015, you can install QODBC v16 and use it with QuickBooks 2015. How do I know what is my CD KEY?? You can get your CD KEY from purchase email from your registered email ID. In case you have deleted/lost email, please raise a support ticket with "Sales - Registration - Activation Department" Click Here for raising a support ticket. Need to download QODBC for QuickBooks 2016 Desktop, have changed computer, can't find on the site. Will the current one work? Each new edition of QODBC also contains the last builds we did of all of the previous editions. So you can use latest QODBC Version with the previous edition of QuickBooks also. Your CDKey will unlock latest QODBC version of the version you were licensed for.